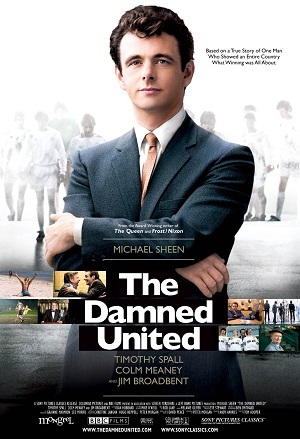 With a ‘93% Fresh’ rating on Rotten Tomatoes, The Damned United was almost universally praised critics upon release in 2009, but panned by most of the characters it portrays. The Damned United chronicles Brian Clough’s 44 days in charge of Leeds United in 1974. The backstory portrays his rise as co-manager of Derby County and his rivalry with Leeds’ legendary boss, Don Revie (Colm Meaney). Much of the appeal of the film lies in the fact that its main character is a real person – the highly-successful and colourful Brian Clough. After Clough achieved promotion to the second flight and won the league within just two seasons, he was the natural choice to take over from Revie at Leeds, after the latter took on the England job in 1974. The story of Clough’s ensuing 44 days at Leeds is a compelling one and much of the interest in the film stems from the truth in the story. The problem with the film is that it ignores facts and adds elements for its own ends. By using a real person as its main protagonist, The Damed United capitalises on the fame of the real man, while offering no genuine insight into Clough’s thoughts or actions behind the scenes– and that is where the danger lies when fact meets fiction. Several of the characters’ real-life counterparts, including Leeds’ midfielders Johnny Giles and Peter Lorimer, complained that the film (and novel) portrays events and dialogue didn’t actually occur. Former Derby player Dave MacKay even sued the film’s production company for suggesting he broke a 1973 players’ revolt to take the latter’s place as manager at Derby. In fact, MacKay left Derby in 1971 to become manager of Swindon Town. It’s small details like this which distort the truth unnecessarily, while also spreading potentially harmful lies about real people. The Damned United is a great film. Michael Sheen is uncanny as Clough and has the accent and mannerisms down pat. He really inhabits the character. Meanwhile, Clough’s relationship with co-manager and friend Peter Taylor (Timothy Spall) is full of warmth; their story (both real and fictional) is one of success and triumph over adversity. While there are other great football films, the true story which underpins The Damned United arguably makes it one of the best about the sport. While the novel is narrated by Clough’s inner voice and portrays him as a vengeful and bitter alcoholic, the film softens these nastier edges. This is a good thing, because when writing the novel, there’s no way Peace could’ve known what Clough was thinking. While Clough’s family still hated the film, the on-screen character is much more likeable than the one in the novel. Even though the “Iron Man and Hulk: Heroes United” wasn’t the best film of the year, Iron Man and Captain America are joining forces next in this all-new, original animated adventure, “Marvel’s Iron Man & Captain America: Heroes United”. The film is being release only on Digital HD, On-Demand and Disney Movies Anywhere, which is an interested move but also a nice way to give good use to their new streaming app. The film sees the return of voice actors Adrian Pasdar and Roger Craig as they reprise their roles as Iron Man and Captain America, as they team up to stop Red Skull and Taskmaster from unleashing an army of Hydra Brutes in order to take over the world. Clancy Brown lends his voice to the villainous Taskmaster. This is a decent improvement over the last film and does include some twists and a cool special appearance by one of your favorite Marvel Super Heroes. Iron Man and Captain America are both sharp and witty characters and play well together here. I am not 100% sold on this style of animation since it feels a little cheap and not as polished as you would expect from Marvel but it is still a decent film. Dave “The Snake” Sabo is the guitarist for the hard rock/heavy metal band Skid Row who recently released the first of 3 EP’s titled “United World Rebellion Chapter 1”. With Chapter 2 set for an early August release and Chapter 3 slated for release in 2015 the band originally from Toms River, NJ shows no signs of slowing down anytime soon. Media Mikes recently had the pleasure of speaking with Snake about the bands current releases, his 28 yr writing/band partnership with bassist Rachel Boland and balancing the duties of being a guitarist and manager. Adam Lawton: Can you give us some background on the second EP you have coming out and why you chose to release the album via 3 separate EP’s? Snake Sabo: The music business is much more different now that it was through the better part of our career. We were raised on doing things a certain way in that you release a record of 12 or 14 songs and then you go out and tour for 2 years. For us that just doesn’t work anymore. We are living in an age of information overload. Things are being thrown at us at such a rapid basis that it’s hard to take it all in and navigate through the white noise. With the way music is being delivered these days we started to feel that maybe less is more. We figured we could hit people with a few songs, let them digest a bit and hopefully you have left them wanting more. Doing things this ways makes sense on a number of different levels. Economically we are able to keep costs down in the studio as we are only in there for about 2 weeks which is awesome. We can also keep the retail/download prices down as well. We aren’t asking the listeners to invest a lot of time or money in to something we are just hoping that we can provide them with something they can get off on and enjoy. We then do the whole process again 8 or 9 months down the line which gives us a steady stream of material being released. Things are very much in the moment because that’s how we are creating it. It is very fresh and pure and not convoluted in anyway. We didn’t go in and write 20 songs that we are just released over time we have written separately for each release so far. Things are working really well for us this way and it feels great. We are having a lot of fun. This new EP was probably the most fun I have ever had doing a Skid Row record. Rachel and I were pretty much on the same page the whole time and everyone in the band was galvanized. We dove head first in to this and no matter where something started it became all of ours in the end. It was really great to be a part of that. AL: The new EP’s both seem to be quite a bit heavier than the bands previous releases. Was this something you did consciously or did that happen more naturally? SS: Things happened very naturally. We want to write the best songs we can within where are collective headspaces are at during that time. Things tend to start out with a conversation and from there we just follow things in to songwriting. This time around we asked ourselves why we make music. It always comes back to it being the most pure form of expression for us even from the time we were teenagers. Music was and still is the great escape for us. We found that feeling again and got back to it. We noticed things really didn’t change from when we used to stand in front of the mirror dreaming we were Gene Simmons or Ace Frehley. Our problems might be different these days but things are just as impactful and dramatic as they were when we were 16. Music is our avenue for expression so we pealed back some layers of the onion to get to the heart of things again and that helped us realize what was going on. From there the light just kicked on and away we went. AL: How has yours and Rachel’s writing relationship evolved over the years? SS: I think we probably know each other better than anyone else in our lives. 28 years will do that. It’s one of those things where if we aren’t hanging out every day we are at least communication in some form or another. It’s very rare we go through a day without speaking. With all the life we have experienced together we just have a tremendous amount of respect for one another. We have each other’s backs regardless. When we are working and I come with an idea in my head and Rachel has a feeling in his heart we go with that feeling over the head every time. That’s not always the easiest thing to do but judgment wise it has always worked out in the end. It takes a lot of living life to get to that point with somebody. I am really proud we have been able to not only coexist but flourish in keeping Skid Row alive for 28 years now. AL: What is it that appeals to you about putting out new music? And is it hard to introduce that new material being that you have such a well know back catalog? SS: Sure it can be hard. You want to be self indulgent but at the same time people are paying money to see you play and you know they want to hear specific songs. I believe there is a way to make both sides happy. I am proud of everything we have ever done as a band. I have no problem playing “Youth Gone Wild” or a new song like “Kings of Demolition”. To me it is all cut from the same cloth so I can be upset if people want to hear one song more than another. I am thankful people want to listen and am very proud of that. We have been introducing some newer stuff and it has been going over well lately and it has been getting more than just a golf clap. The songs are infectious so you can’t help but bob your head to a song like “Kings”. When I go to shows I find it exciting to hear new music. I remember seeing Soundgarden open up for Neil Young one time and they played the song “Spoon Man”. This was just before “Super Unknown” came out. I loved that song! I think about how that experience had an impact on me and I hope that our material will have the same impact. AL: The band has been out since April touring. How far will this current tour run take the band? SS: We are booked through mid December. We plan to take some time off for the holidays and we are talking about getting together sometime in January to start writing the 3rd EP. With the second EP coming out in August we want to go out and tour on that as well so by January it will have been out 4 or 5 months by then so we will probably want to tour some more in support of that. Our goal is to tour 6 to 8 months for each EP release. A lot will depend on how the releases are received by the public as well as with where are heads are at when we decide to sit down and start writing. As long as we are still having fun each night we will continue to be out there. AL: You also manage bands. How do you go about balancing your duties for each project? SS: I don’t know. (Laughs) I love working with the guys from Down and Vintage Trouble. Doing that almost balances everything out. At one point I’m out on the road doing shows and all that and then I get to step out of that roll and in to the role of manager where I still get to be involved in music but on a different level. It can be trying at time but technology has a wonderful way of keeping everyone connected. If I didn’t have that I don’t know what I would do. The hard rock band Skid Row kicked off their “United World Rebellion Tour” on July 9th in Rochester, NY in support of their upcoming release titled “”Rise of the Damnation Army, United World Rebellion: Chapter 2. The release is the second of several EP’s the band has planned for release this coming year. Though this was the first night of the US tour run the band seemed tight and ready to take their classic signature sound to the masses. Montage Music Hall an intimate music venue tucked into one of the bustling side streets of Rochester, NY played host to a bevy of music artists all out to support their own endeavors along with setting the stage for the launch of Skid Row’s “United World Rebellion” Tour. Though the bill featured 5 bands in total the old saying “quality over quantity” seemed to have been ignored. Opening up the night was local act Methanol and though the band seemed well rehearsed they did little to capture the attention of those who came out to the venue early as their stage presence and crowd interaction needed some attention. Exit Sky another local act whose sound could be described as a mix between early Creed and Pearl Jam followed and seemed to garner quite a few cheers from the small crowd in attendance. Closing out the list of local performers was The JJ Lang Band. The group’s performance was certainly my favorite of the 3 local support acts however; early on in the group’s 30 min set the band experienced some technical difficulties causing the lead singer/guitarist to throw his guitar on the ground in disgust. Though the guitar sound was noticeably thinner from there out I found the vocals to sound much better when that was all that was being focused on by the group’s front man. The Massachusetts rock band Sakara would take the stage next as direct tour support a spot they will hold throughout this leg of the “United World Rebellion” tour. The band performed a solid set that seemed fairly well received by the crowd on hand who were anxiously awaiting the night’s headliner. After a rather length set change Skid Row would hit the stage helmed by lead vocalist Johnny Solinger who is celebrating his 14th year with the band. Flanked by original members Scotti Hill, Rachel Boland and Dave “Snake” Sabo and the groups newest member drum Rob Hammersmith the band flew through its 90 minute set playing a number of songs from their back catalog including “18 and Life”, “Monkey Business” and the always popular “I Remember You”. The band also performed one or two news songs which fans seemed to enjoy just as much as the older material. Though it would have been killer to see/hear a 2 hour plus set from Skid Row and fewer local acts overall the show was a pretty decent night of music. Sure there were a few times where Solinger seemed to max out his vocal range however the solid combination of Boland, Sabo, Hill and newcomer Hammersmith provided the perfect support system to keep the night going smoothly and even though a full fledged Skid Row reunion may be just a pipe dream for those of us who grew up with the band the current incarnation of the band is just fine by me and certainly worth going to check out. After “The Avengers”, Marvel superheros have never been in higher demand! And who doesn’t love a great team up. Iron Man is obviously everyone’s favorite character and Hulk was the fan-favorite from “The Avengers”. This brand new animated film makes cinematic history and teams these two unexpected heroes together. The film is pretty jam-packed with action and great humor, which is a must for these two characters. Adrian Pasdar (“Heroes”) returns to voice Iron Man/Tony Stark and as does Fred Tatasciore (“Hulk and the Agents of S.M.A.S.H.”) for the Hulk and wrapping it up Dee Bradley Baker (“Star Wars: The clone Wars”) introduces and gives a voice to our new villain Zzzax. Now that Disney owns the Marvel brand, I hope that we are going to be seeing many more of these in the coming months! Recommend for any Marvel fan…young or old. Official Premise: In this action-packed teamup, the Invincible Iron Man and the Incredible Hulk come together to save the Earth from its greatest threat yet. When two HYDRA scientists try to supercharge a Stark Arc Reactor with Hulk’s Gamma Energy, they unleash a being of pure electricity called the Zzzax, and he’s hungry for destruction. Together, Iron Man and Hulk are the only force that stands in the way of the Zzzax’s planetary blackout. But first the superhero duo will have to get through snarling Wendigos, deadly robots and the scaly powerhouse, Abomination. Can two of Marvel’s mightiest heroes find a way to work together without smashing each other before time runs out? What I like about this film the most is that it is being made by people who know superheros. Eric Radomski (TV’s “Marvel’s Ultimate Spider-Man,” “Batman: The Animated Series”) was the Supervising Creative Director. The Executive Producers on the project are Alan Fine (“Marvel’s The Avengers”, “Thor”, “Iron Man 2”), Dan Buckley (TV’s “Marvel’s Ultimate Spider-Man,” “Marvel’s Avengers Assemble,” “Marvel Hulk and the Agents of S.M.A.S.H.”), Joe Quesada (TV’s “Marvel’s Avengers Assemble,” “Marvel’s Ultimate Spider-Man”) and Jeph Loeb (TV’s “Marvel’s Agents of S.H.I.E.L.D.”). The film was also written by Henry Gilroy (“Batman: The Animated Series,” “Batman Beyond”) and Brandon Auman (TV’s “Iron Man: Armored Adventures,” “The Avengers: Earth’s Mightiest Heroes”). So plenty of experience here! “Iron Man & Hulk: Heroes United” comes packaged as a combo pack with a Blu-ray + DVD + Ultraviolet Digital Copy. Disney/Marvel has been using Digital Copy Plus now, which is a real treat! The 1080p transfer works wonderfully with the animation, which is quite sharp and very colorful. You can see the difference between the usual TV style animation and the quality feature film animation. There is a lot of detail but into making this look great. The DTS-HD Master Audio 5.1 also delivers a huge HULK SMASH to your surround sound systems. It works very well with the non-stop action and sound effects as well. In terms of special features, they are not outstanding but still cool and worth checking out. Firstly we get “Marvel Mash-ups”, which are three super cool shorts from old Marvel cartoons with new voice actors overdub scenes. Note, though if you pause the film you get “Marvel Inter-missions”, which includes even more hidden ones. The only other bonus feature is a chat between Marvel’s Chief Creative Officer Joe Quesada and Ryan Penagos (Agent M on Twitter) about Iron Man and Hulk’s history together and other things Marvel. Definitely worth checking out also. No question, this will make a great gift this holiday season! Skid Row is back with their first new studio release in 7 years titled “United World Rebellion- Chapter One”. The EP features 5 new songs from the band who once dominated the charts with hits such as “18 and Life”, “Youth Gone Wild” and “I Remember You”. “United World Rebellion- Chapter One” is the bands first release since signing to Megaforce Records earlier this year and is the follow up release to the 2006 album titled “Revolutions Per Minute”. Though the band may look a little different these days their style and attitude remains the same. Blistering guitars and razor sharp vocals blast your ears relentlessly over the EP’s 5 tracks. Vocalist Johnny Solinger who joined the group in 1999 stays true to the original sound of Skid Row while adding his own southern flare. Original members Dave “Snake” Sabo, Scottie Hill and Rachel Boland provide the complementary instrumentation while the bands newest member drummer Rob Hammersmith provides a steady back beat acting as the proverbial icing on the cake. Songs such as “Kings of Demolition” and “Get Up” are stand alone rockers while the country tinged “This Is Killing Me” slows things down a bit and gently tugs at your heart strings. Though not as strong as some of the bands other recent releases “United World Rebellion- Chapter One” is a good start and with the band planning to release a couple more EP’s later this year listeners will definitely want to start with a copy of “United World Rebellion- Chapter One”. Starring: James Corden, Stephen Fry, Dawn French, Joanna Lumley, Jim Broadbent and Vanessa Redgrave. If you feel like you have never heard of this film, don’t worry you haven’t. “Animals United” is Germany’s first RealD 3D Animated Feature Film. Although this English language version does not come with the 3D. I think that this is a very poor decision because I have seen an high def 3D version of this film and it works much better. I feel like it is a mix between “Madagascar” and “Ice Age”, except doesn’t really come close to their charm. Of course let’s not forget this film is aimed at kids and as long as it comes packed with action and talking animals they will be happy. The film is based on the 1949 book with the same title by Erich Kästner and takes place in the African savannah where all of the animals are looking for water. Billy the Meerkat and his best friend, Socrates the Lion set out in search of water. They get help from their friends Angie the Elephant and Giselle the Giraffe and set out on an incredible journey. Along their way they meet a motley group of animals that are new to Africa like a rooster, polar bear, kangaroo, koala, Tasmanian devil and two turtles. They all team up to find what happened to the water and to get it back. The US release voice cast is impressive. James Corden (“The Three Musketeers”) plays Billy the Meerkat, the amazing Stephen Fry (“Alice in Wonderland”) voices Socrates the Lion, Jim Broadbent (“Harry Potter” series) plays Winston the Tortoise , Vanessa Redgrave (“Letters to Juliet”) plays Winnie the Tortoise and lastly Andy Serkis (“Lord of the Rings” series) voices Charles the Rooster. Also if you are looking for special features, guess again, this is a complete bare-bones release.